French motorcyclist David Casteu has been forced to retire from the Dakar Rally after he suffered a broken leg. French motorcyclist David Casteu has been forced to retire from the Dakar Rally after he suffered a broken leg in the fifth stage. Chilean Francesco Lopez won the stage to move into second overall while Cyril Despres retained the overall lead of the motorcycle section. American Mark Miller won the car stage after he beat Volkswagen team-mate and former world rally champion Carlos Sainz. French motorcyclist David Casteu has been forced to retire from the Dakar Rally after he suffered a broken leg in the fifth stage of the race in the Atacama Desert. 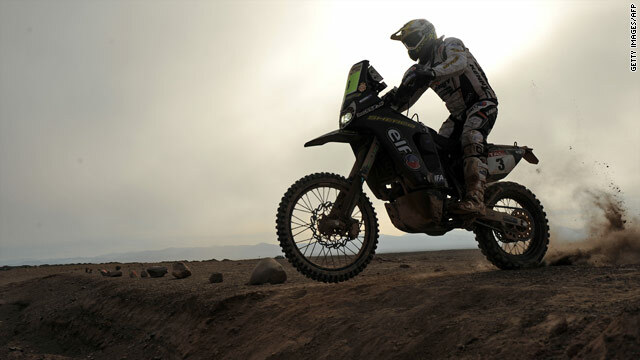 Casteu won the opening motorcycling stage of the rally and was considered among the favorites before he suffered the injury in arduous 483-kilometer stage between Copiapo and Antofagasta. Chilean Francesco Lopez won the stage to move into second overall while Cyril Despres retained the overall lead of the motorcycle section after he finished one minute 30 seconds behind Lopez. Casteu admitted he was at fault for the crash which happened as he pursued Lopez and was blinded by a cloud of dust sprayed up by the Chilean's bike. "It is an error on my part. I got too close to Lopez," Casteu told the Dakar Rally Web site. "I flew through the air but I remained conscious. I crawled to my motorbike to get to my radio. I was afraid that the artery in my leg had been severed." I flew through the air but I remained conscious. American Mark Miller won the car stage after he beat Volkswagen team-mate and former world rally champion Carlos Sainz by two minutes 10 seconds. Although Sainz moved to top of the standings after Frenchman Stephane Peterhansel suffered problems during the stage and was completely immobilized for 50 minutes. Volkswagen dominated the podium on the stage as Nasser Al-Attiyah finished third and they also fill the top three positions in the overall standings with the Qatari in second place and Miller third.